The following post contains affiliate links. A couple of weeks ago a friend of mine and I went to Chestnut Ridge Winery in Spencer, WV for a little picnic lunch. It was a beautiful day, and a perfect lunch. The thing that stood out to me the more, aside from their amazing wines, was the DELICIOUS truffle cheddar cheese my friend had bought from Aldi. As soon as I tasted it I was in love and I knew I was going to make a Truffled Mac-and-Cheese when I got home. To begin you will need to preheat the oven to 350 degrees. Then place a pot of water over a medium/high heat, and add a tbsp. of salt. 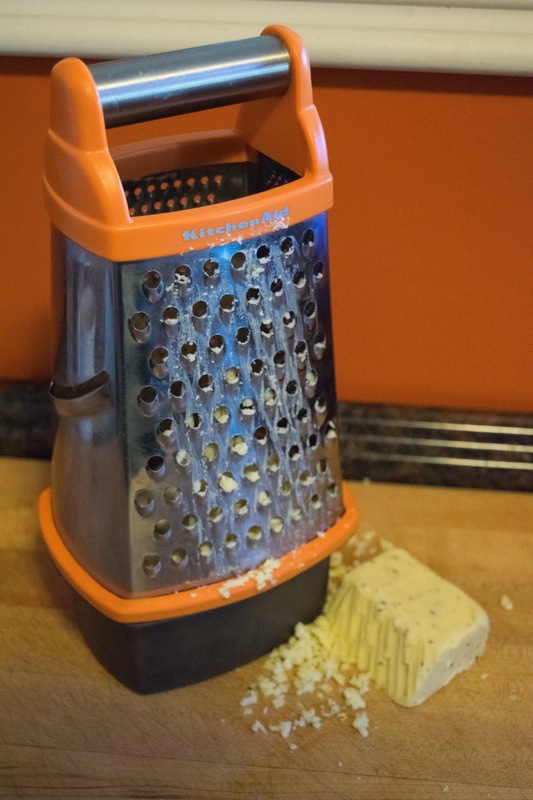 While you are waiting for the water to boil, you can grate your cheese. Don't you just love my orange cheese grater. Then in another pot, add the butter and let it melt. Add the flour to the melted butter. You will need to whisk it into the butter and let it cook about a minute. This will get the raw flour taste out of your roux. Next you will add the milk. Whisk the sauce until it there are no lumps and it begins to thicken. To help ensure you won't have lumps, you may want to let your milk come to room temperature or warm it up a little in the microwave. By now your water for the pasta should be boiling, so add the pasta. Cook it according to the instructions on the box. Now back to the sauce. Using a microplane, you will grate the fresh nutmeg into the sauce. You don't have to use fresh nutmeg. The jarred stuff will work just as well. Once the sauce has thickened, you can turn off the heat and add 2/3 of the shredded truffle cheese. Whisk it into the sauce until the sauce is totally smooth. and pepper you feel it needs. At this point your pasta will be finished cooking. Drain it, and add it to the sauce. Stir it all together until it is well coated. 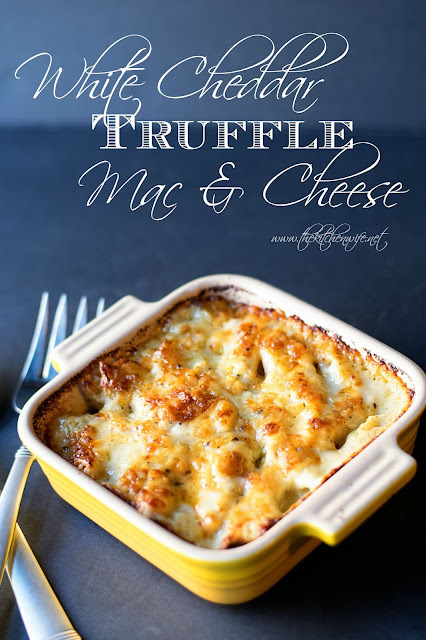 You can make this Truffled Mac and Cheese in a 9 x 13 baking dish, but I had these cute little individual ones that I couldn't resist using. Make sure you butter them or spray with cooking spray. 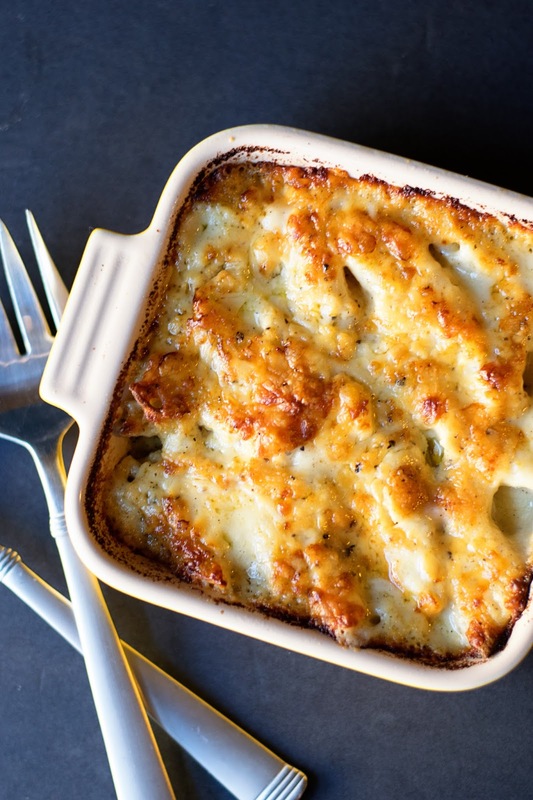 No one wants their mac and cheese to stick to the pan. Portion the Truffled Mac and Cheese, equally, into the baking dishes. Then, top with the rest of the shredded cheese. I like to put my baking dish on a baking sheet so that it will not make a mess in my oven if it bubbles over. Place into the preheated oven for 30 minutes and voila! It is finished! It will get brown and bubbly in the oven, but because I like the crispy bits, I put it under the broiler for a couple minutes as well. Place a pot of water on the stove, add salt, and bring to a boil. Once the water is boiling add the pasta and cook according to the directions on the box. While the water is coming to boil you can grate the cheese. Next place another pot over medium/high heat and add the butter. Once the butter has melted, whisk in the flour and let cook 1-2 minutes. Pour the milk into the flour and butter mixture and whisk until all of the lumps are gone and the sauce starts to thicken. Grate the nutmeg into the white sauce. Once the white sauce has thickened turn off the heat and add 2/3 of the shredded cheese. Whisk the cheese into the sauce until it is completely melted. Taste for seasoning and add and salt and pepper you feel it needs. Add the cooked pasta to the sauce and stir until it is fully coated. 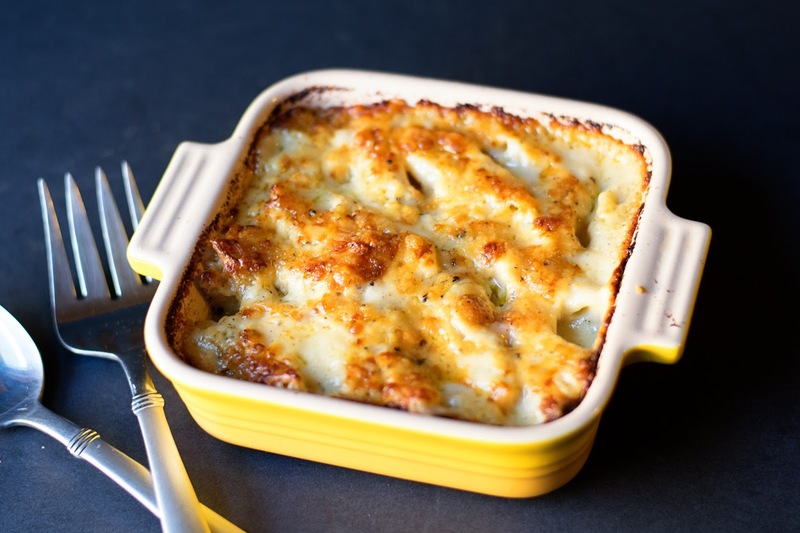 Add the pasta and cheese mixture to a greased 9 x 13 baking dish. Top with the remaining cheese and place into the oven. Oh my goodness! I didn't even realize I left that off! I will fix it right now. I actually use 2 cups for this recipe.